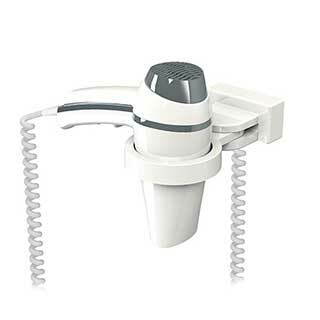 A modern ABS plastic white wall mountable bathroom hairdryer. 1400 Watt gun grip style. 6 drying settings: Air flow: 70 & 90 m3/hr. 3 temperatures (including cold). It has a patented light touch handle which switches on by simply picking it up. Ideal for use in a bathroom setting as it is thermally insulated and splashproof. Suitable for bathroom Zone 3. Electrical installation Class 11, IP21. N.B. The unit must be hardwired and installed by qualified electrician to comply with Part P regulations. Guarantee 1 year (not valid if used in public areas, spas, gyms, swimming pools). Dimensions: 185 (D) x 100 (L) x 45 (H) mm. Rated power : 1400w. Power supply: 230 V – 50/60 Hz. Available in White or Black only. E45.0.